The KAB MSX-1 Remote Mono Stereo Switch lets you use your stereo cartridge to get equally great sound from your mono recordings . Since the MSX-1 is a remote design, it allows the switch to be connected with the shortest possible leads and the selector to be placed just where it is needed. The wired remote drives a battery powered latching type relay. This type of relay uses power only when changing positions, so battery life is extended. The MSX-1 is hand wired with high quality shielded cable and high quality, machined teflon insulated RCA jacks. 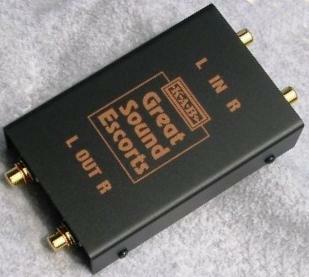 Have you noticed the cheap RCA jacks creeping into expensive gear lately? 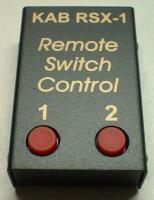 Also check out our RSX-1 2 into 1 remote switch box too. Dealers and audio clubs will find the remote concept useful in group listening. the remote cable can be extended easily. Dimensions Switch Box 7.5" x 4" x 1.4", Controller 2.5" x 1.75" x 0.75"
Hi quality components provide reliable switching of line and phono level signals. Remote design allows the switch box to be connected with the shortest leads. By Isolating left and right signal grounds, ground loops are avoided which can cause hum in phono connections. Also, the chassis ground is isolated and has its own ground post. High quality Components from Pansonic ensure reliable connections and long life. In a stereo groove, the stylus moves both laterally and vertically to produce the stereo soundstage. In a mono groove, the stylus only moves laterally. However, groove surface imperfections and cutting abnormalities can cause the stylus to move vertically. This produces out of phase stereo noise and distortion that has no relationship to the actual recording. When you combine the left and right channels with the MSX-1, those aberrations effectively cancel out leaving a cleaner, quieter surface and better focused sound. Thus achieving electrically , what is often claimed to only be possible with a special cartridge. Latching relays are unique in the way they function. Normally, we think of relays as on and off devices using power constantly when on. Latching relays use a mechanical latch to hold the relay in each postition, so power is only used to make the transition. Remove the power and the relay stays until you command it to change. Power is only used in short pulses, making long battery life possible.